Reflections on the culture surrounding altar boys for the Tridentine Mass. I well remember the day that Sister Mary C called all the boys from my fifth-grade class into the chapel for a special meeting. She announced that it was time for us to commence instruction for becoming altar boys. We should plan on staying after school at least once a week for the next several months. This was met with a wide assortment of reactions, from groans ("What about baseball?") to moans ("Mom’s gonna hate making a special trip to pick me up an hour later than my sister") to assertive smiles ("It’s about time!"). One special note: these sessions would be supervised by Father D from a nearby parish because our school, being attached to a convent rather than a church, had no priest in residence. "We’re going to do this, and do it, and do it again," said the man in black standing beside the altar, Roman collar blaring, "until it’s right." And boy, he wasn’t kidding. After grilling us on pronunciation for the first few weeks, and then meticulous memorization, he proceeded to guide us through all the motions. Since the duties of the altar boy on the Epistle side were substantially different than those of the fellow on the Gospel side, Father made sure that each of us had gone through copious rehearsals in either role—not to mention "solo flights," since it was always feasible that the other guy wouldn’t show. All contingencies had to be covered: Low Mass, High Mass, Rosaries, Baptisms, Stations, Processions, Requiems and Benedictions. Father D warned us that we would have to undergo special training sessions as Holy Week loomed on the calendar, since those liturgies only happened once a year, each was unique, and each had to be rehearsed and executed as smoothly as if we’d been doing them all the time. Pressure mounted as the dates of our "first Masses" approached. In those days, we not only had to undergo the scrutiny of the nuns who were also our classroom teachers, but also our older brothers who had gone through the wringer a few years before, not to mention our fathers who had carried the candles and cruets in their youth as well. Everyone understood that there was one—and only one— correct, proper, and appropriate way to serve Mass. All eyes would be upon us, and that in itself would have been enough to keep us focused. But older brothers added to the tension by telling us horror stories from their serving days, frightening tales of altar boys being "skinned alive" by the priest after Mass if the Altar Missal wasn’t in place when he turned to read from it, or the wine cruet wasn’t poised just so when he held out the Chalice for the ablution after Holy Communion. "Everything had to be right. Nothing was too good, no motion too careful, no action too diligently executed before the Throne of God." In retrospect, this fierce attention to detail, spurred by priests and elders, were all proper and to be expected in a religion which offered Solemn Sacrifice to Almighty God on a regular basis. Everything had to be right. Nothing was too good, no motion too careful, no action too diligently executed before the Throne of God. It made us fret and sweat, but the result was an orderly Rite of Mass, performed with apparent ease, dignity, attention to detail, and a great sense of purpose. It meant more than I can express when Dad, who had converted to the Faith in middle-age and therefore missed this particular opportunity himself, put his hand on my shoulder and said, "Son. I’m proud of you." It was also amazing, once my fellows and I began serving Masses at the convent, how what one Father had pounded into our heads applied to every other priest who came along from whatever parish. Each priest’s motions were virtually identical, right down to how far he spread his hands and where he directed his eyes when he turned to say "Dominus vobiscum." If every priest was so well-rehearsed, then surely we should be. And if we made a stupid mistake during the Consecration, we deserved a stiff talking-to in the sacristy afterwards. We may have not liked it much at the time, but in retrospect, as I said, it made sense. It was also a golden opportunity for each of us young men to view the Mass up close, to hear the whispered words of Consecration, to watch the hand motions of the priest— and from a vantage point never achieved even by Sister Mary C, or even her Reverend Mother! It was a man’s world, a sacerdotal reserve, and it was from encounters and experiences such as these that young men would find inspiration in their hearts to follow suit, to pursue Holy Orders, and carry on the Catholic Torch to the next generation. "It was a man’s world, a sacerdotal reserve, and it was from encounters and experiences such as these that young men would find inspiration in their hearts to follow suit, to pursue Holy Orders, and carry on the Catholic Torch to the next generation." Of course, all this happened in a context, in a culture if you will, in which the Mass was regarded by all Catholics as the Supreme Prayer of the Church. Fathers watched their sons serving at the altar steps, and felt pride in their hearts. Mothers looked on with hopes for an Ordination in the coming years. The Mass went on, unchanged, preserved, distinct from all other forms of worship, miles above other religions, the meeting of God and Man on the Altar. The effort was worth it, for the point was the hope of Eternity. The priest was not even above instructing the congregation if their movements had become slovenly or lackadaisical. "When I say ‘Per omnia secula seculorum’ at the conclusion of the Offertory," Father would say from the pulpit, "you should all stand immediately. And when the bells ring for the ‘Sanctus,’ you should fall to your knees as one." The proper forms were to be observed by all, not just those within the Sanctuary. Today, of course, altar boys who do serve Latin Masses seem to be doing so in a cultural vacuum. Their older siblings were raised in the New Rite, and have no advice to give their younger brothers. As meticulous as the priests who still say the Latin Rite may be, their servers for the most part do not seem all that well-rehearsed. There are a lot of young altar boys going in circles, not sure where to kneel, no clue where to stand. And the congregations, well, they seem to make educated guesses about whether to sit or kneel, and hope for the best. All of which leaves me, at least, a bit disappointed. We are so fortunate, those of us who still have access to the Latin Mass. There are many cities and towns where Catholics have no such opportunities. If we believe the Mass is so precious, perhaps we should spend some time making it more so. Things would go more smoothly if some of our priests would simply spend a sermon or two instructing their congregations again on the proper moments to sit, stand, and kneel. Altar boys would fare better if the priests ran them through rigorous rehearsals rather than expect the older altar boys to instruct the younger initiates. Yes, this would take an extra effort, and we’re all strained for time. But if the thing is worth doing, it’s worth doing well—no, more than well. We must strive for perfection, knowing we’ll never attain it, but reaching for it nonetheless. If we believe the Mass is what it is, then we should leave no stone unturned in making it the most reverent response to God in our humble power. 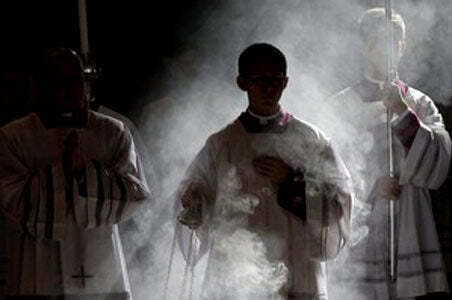 It is only right, and once the work is done, the pleasure of a smoothly-executed liturgy will be only part of the reward. Then we’ll have something worthy to pass on to the next generation.